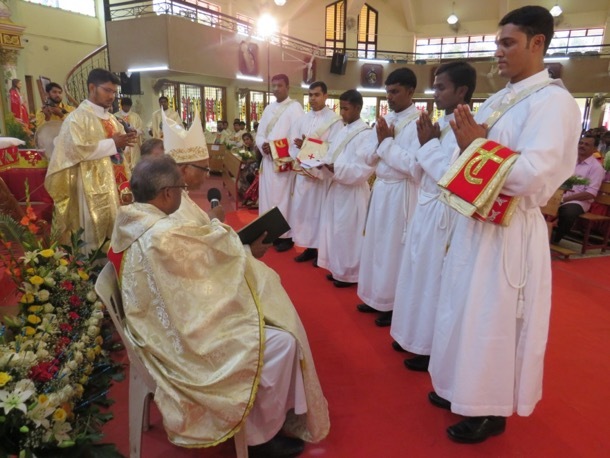 BANGALORE, India – On June 5, 2018, the Indian Province celebrated the priestly ordination of six Montfortian deacons at St. Thomas Forane Church. The day was also remarkable because it was the ordination day of our Founder, Fr. Louis de Montfort in France. The six confreres who were ordained as priests are: Deacons Arun, Jayakumar, Prakash, Bala, Nashwin and Ravi. They were ordained by our Montfortian Bishop, Rt. Rev. Dr. Raja Rao, Bishop of Vijayawada. Our Superior General, Fr. Luiz Augusto Stefani SMM, and the General Councillor, Fr. Rosario SMM, graced the occasion. Their presence was very special to us. In addition, the family members of our newly ordained priests, the religious and the invited people were extremely happy during the occasion. On 6th of June 2018, the newly ordained priests offered their First Mass for the Maria Bhavan community. It was a charming day for the scholastics to witness those events as they prepare themselves to reach the Altar of the Lord. As they begin their new voyage, we wish them all the best for their apostolate and assure them our prayers. Qué lindo, cuantas vocaciones, unidos por la oración, bendiciones. . . ! ! ! Dear Frs Arun, Jayakumar, Prakash, Bala, Nashwin and Ravi. I am Patrick Brennan, but as your confrere, Fr Nashin is aware through our recent email communications, everybody calls me Pat. I am a former Montfortian seminarian and novice, but I never reached ordination. I am very involved in Montfortian life and charisms here in England, Malawi and Uganda. I congratulate all six of you on your ordinations into SMM life on the 5th June. God bless you all, your families and each of your communities. What a privilege to be ordained on the same ordination date as St Louis Marie. I hope this message reaches you all, because a few minutes ago, I tried to send my congratulations on your recent SMM ordinations, but it failed. As your confrere Fr Nashwin is aware, I am a former Monfortian seminarian and novice here in England, but I never reached ordination. I am still very deeply involved in SMM life and work in England, Malawi and Uganda. God bless you all, your families and your current communities.